Since the 1990s, the practice of Sydney-based photographer Robyn Stacey has shifted from her work based on popular culture and film noir to densely layered meditations on Australia’s past and the make-up of its colonial cultural legacy. Collaborating closely with natural and local history collections such as those at the Macleay Museum and Elizabeth Bay House, Stacey has utilised the objects found within in order to reconstruct a vivid window into the past. 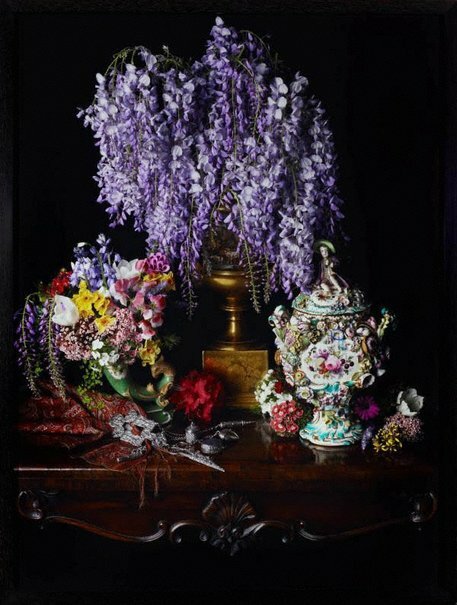 ‘Chatelaine’ 2010 is one such act of reincarnation drawn from the holdings of Vaucluse House in Sydney. Arranged and lit like a 17th century Flemish still life the carefully cluttered objects on the ornate side table are as dazzling as they are overwhelming in their ‘baroque’ splendour. What strikes one immediately is their cumbersome inefficiency. Rendered almost functionless with over designed surfaces and drowning in flower arrangements, their only use seems to lie in their visual impact. The titular chatelaine, like the rest of the objects, acts as a metaphor with its double meaning signifying a woman who owns a large estate and a belt chain for carrying a sewing kit. The charming innocuousness of this stylistically mismatched arrangement gains a deeper dimension when we learn that the objects indeed belonged to such a wealthy woman – Sarah Wentworth. Ostracised by Sydney society due to her convict background, the lady of the house resorted to assembling material signs of culture and prestige – almost all imported from Europe - as a counterpoint to her unfortunate legacy. The richness of Stacey’s narrative layering unfolds gradually, with bits of information that reveal a profound significance beneath the artifice of the objects. Evoking the long lost presence of their owner, the possessions of Lady Wentworth are also subtle tools of inquiry. Aimed not only at patriarchal notions of femininity, Stacey’s critical re-enactment addresses the anxiety about the unresolved nature of Australian colonial identity. Georgina Cole, Look , 'Australian photographs past and present: What they say about the people and the country', pg. 26-30, Sydney, Mar 2015, 28 (colour illus. ), 29, 30. The photograph and Australia , Sydney, Jun 2015, 33 (colour illus. ).